Where do I use my Kong Online voucher code? Kong Online provide a huge array of men’s fashion from top brands like Adidas, Air Jordan, Carhartt WIP, Champion, Converse, Huf, Levi’s, Nike, Obey, Stussy, The North Face, Vans and many more. Discover a wide variety of men’s clothing at Kong Online including denim, hoodies, jackets, knitwear, outerwear, shirts, shorts, sweatshirts, t-shirts, track pants, track tops, tracksuits and trousers. As well as this you can also find a supply of casual women’s wear for edgy girls who love the laid-back look. Discover women’s dresses, leggings, shorts, t-shirts, trousers, track tops, track pants, hoodies, outerwear, jackets, sweatshirts, skirts, vests and tank tops. As well as a huge array of clothing and apparel, Kong Online also stock footwear for both men and women including sneakers, boots and shoes. You can also find a huge selection of accessories including bags, luggage, headwear, watches, wrist wear, eyewear, wallets, shoe care, belts, socks, shoelaces and phone accessories. If you’re looking for skatewear you can also discover skate apparel, footwear, decks and hardware on the Kong Online website. For new in products, there’s a ‘new arrivals’ section where you’ll find the latest footwear, clothing and accessories and also an impressive sale section where you can save up to 70% off. Kong Online have a fantastic blog section where you can find loads of posts and articles about the trendy footwear and clothing offered at Kong Online. Find information on new products from huge brands like Nike, discover details about big brand events and gain first access to information on upcoming in-store and online clothing drops from brands like Stussy. The Kong Online blog section is updated regularly with new posts, so make sure you check back often to find new details on all things apparel and footwear. If you’re looking for stylish new apparel, footwear and accessories, but don’t want to spend a fortune on replenishing your wardrobe then check out the sale section at Kong Online. This handy category allows you to save a fortune on your orders with up to 70% off an array of stylish and top quality products. Discover money off huge brands like Adidas, Asics, Champion, Nike, Levi’s, Penfield and many more, and stay stylish with well-known names for less. If you’re a keen skateboarder who likes to look the part on the ramps then check out the skate section at Kong Online. Here you’ll find an array of skate clothing including denim, headwear, jackets, outerwear, shirts, shorts, t-shirts and trousers from brands such as Adidas Skateboarding, Levi’s, Polar and RIPNDIP. As well as all this clothing you can also discover suitable and stylish skateboarding footwear as well as skate hardware and cool decks. If you are not fully happy with the goods you have received, you can return them within 14 days of receipt, providing they are in original resalable condition. Kong Online is a high-quality retailer of men’s casual wear and skate wear, providing a huge variety of clothing, footwear and accessories from cool and edgy brands like Champion, Stussy and Vans. Although primarily for men, Kong Online also stocks a small supply of women’s wear and have tons of products on their site that can be classed as unisex. 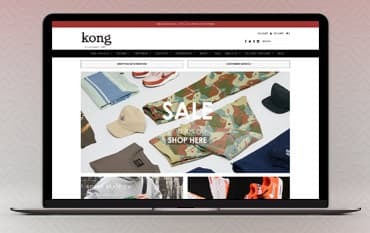 Shop online at Kong Online with a discount code from us and save a fortune on your trendy apparel and footwear, allowing you to keep looking smart and stylish, without breaking the bank. At Kong Online you can also enjoy a great sale section where you’ll find up to 70% off and you can also gain access to loads of great offers and deals when you sign up to the newsletter.